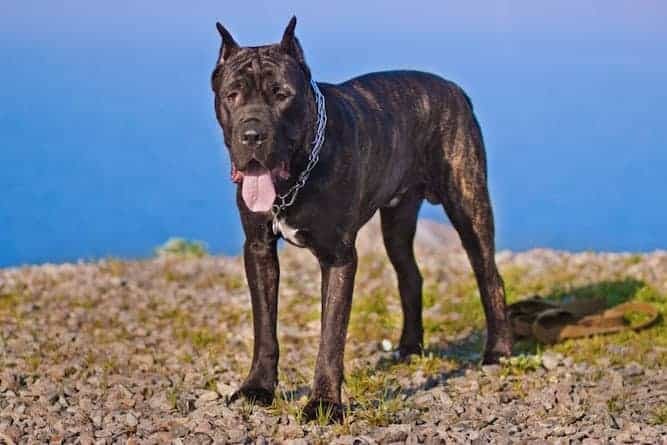 Although they may look mean with their strong and muscular bodies, you will be pleasantly surprised by the gentle and docile Cane Corso temperament. 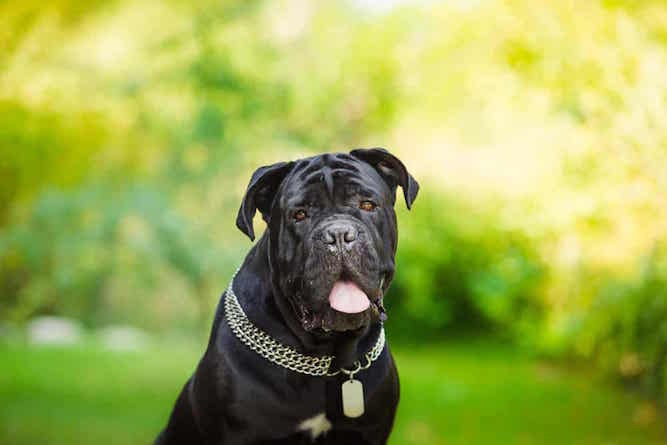 Before we look closer at the Cane Corso's Temperament and its other attributes here is a brief history on the Cane Corso. Originally bred in Italy to be working dogs, the early Cane Corsos were often used for sheepherding and as guard dogs. This has left this breed with incredibly strong protective instincts and they are often quite wary of other people and animals, especially those that come on their territory. Still, they will very rarely fight unless provoked and are typically very docile and sweet. The Cane Corso is everything you want in a dog you are trying to train. He is intelligent and willing to learn. He is also eager to please, which certainly helps. In fact, Mastiff owners say the Cane Corso is by far the most responsive Mastiff when it comes to training. The Cane Corso’s even-tempered nature makes him a wonderful dog to have around children. He is a docile, devoted, and affectionate dog. The Cane Corso is inherently stable and reliable. However, if you do not socialize him well enough early on, he can develop a tendency to be possessive, territorial, and dominant. 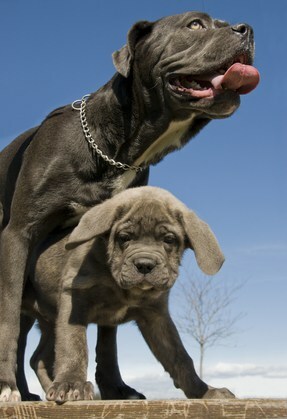 Like all Mastiffs, the Cane Corso can be reserved around strangers if you do not socialize him well enough as a puppy. With the right amount of socialization and training, the Cane Corso will drop some, if not all, of his reservations. He just needs you to help him get there. If you can’t stand a dog that barks for no reason, then you’ll love the Cane Corso. He is a mostly quiet dog, so when he barks, you know something important is going on. A well-adjusted Cane Corso will be a protective dog, but he will be calm about it. He will stand in front of someone to guard them, rather than aggressively going after the offender. Despite their powerful physiques, Cane Corso make excellent family pets due to their gentle nature and are incredibly loyal to their owners. 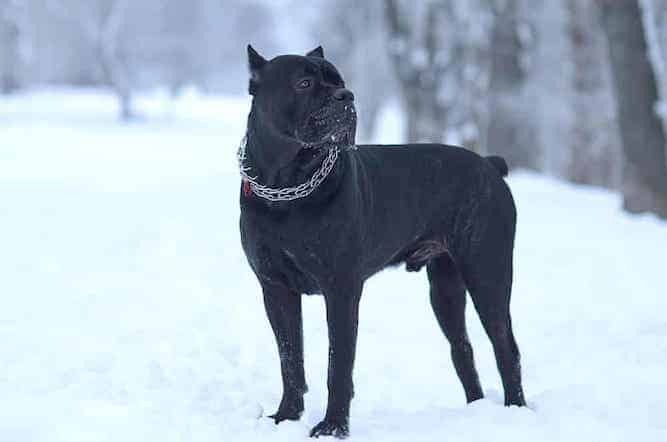 The first thing most people would think of when looking at a Cane Corso is a guard dog, and in fact, they do make excellent watch dogs due to their ever-watchful and protective nature. Although typically a very quiet breed, the Corso will still bark whenever it sees anything it deems to be suspicious. Due to this watchful nature, it is important to make sure to properly socialize these dogs while they are still puppies. This will ensure that you are able to control their protective nature or else they may start to find all strangers threatening. With proper training as a puppy, the otherwise docile and loving Cane Corso temperament can shine through. 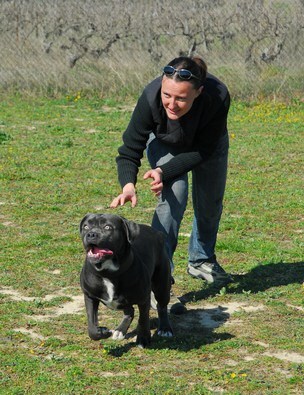 The Cane Corso temperament is that of a working dog, so they are very smart and have lots of energy. In fact, those who are in-the-know say the Cane Corso beats all other Mastiff breeds hands-down. This is partly because of how athletic and agile he is, as well as his keen sense of adventure. Because of their energetic nature, it is important that they have a big yard to run around in and they also need to be taken on a daily walk, or preferably, a jog. Click here for 10 benefits of exercising your dog daily. If they do not get enough exercise, they will soon start to feel bored, which is when you will start to see bad behavior. 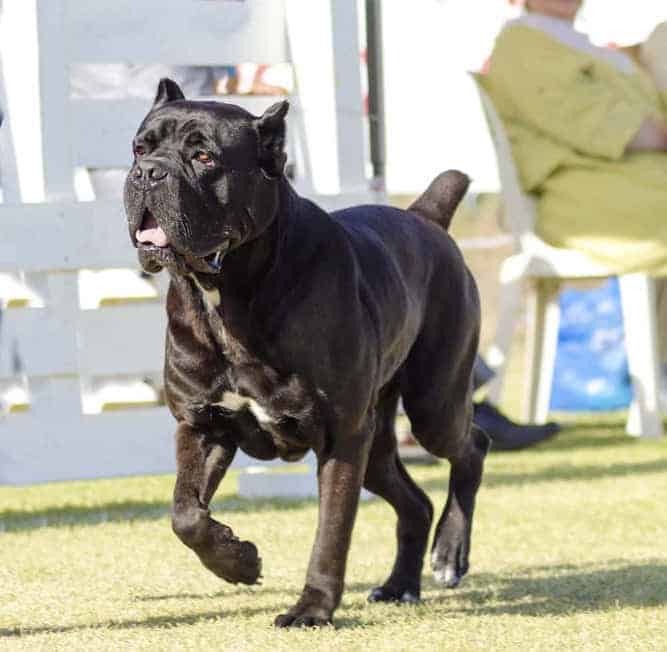 All working dogs need to feel like they have something to do and if they don’t, the Cane Corso temperament will change into that of a nuisance. They will quickly start chewing on anything they can find. Click here to find out how exercise helps eliminate bad dog behaviors. Another thing a bored Cane Corso will almost always do is start digging holes all over your yard. If you see your dog start doing this, you should know it is not getting enough exercise and work on it immediately. If not, the bad behavior can start to become permanent. While these dogs are very obedient and easy to train, they can also become restless and have behavioral problems if neglected. Basically, the Cane Corso temperament depends on you paying attention to the dog and making sure it gets enough exercise and play. Something else that is important to note is that some have expressed concern as to whether the Cane Corso is a dangerous dog. One thing to understand is that the Cane Corso is very much like the Pitbull in that he gets a bad rap. Many people have used both dogs for their own nefarious purposes. A dog is only as good as the owner who trains him. If the owner trains him to be aggressive, then he is more likely to be aggressive. However, the answer here is no, the Cane Corso Italian Mastiff is not aggressive with people by nature. You may want to spend some time with one before you adopt, though, since most shelters do not know each dog’s history. He may have difficulty getting along with similarly sized dogs of the same gender. Again, socialization should fix this, but it’s important to keep in mind if you adopt an older dog. The Cane Corso tends to be uber-sensitive to the slightest sense of danger or distress. For this reason, even though he is good with children, you should still supervise him around them. That goes for any dog though, really. Proper training is key to bring out the desirable Cane Corso temperament. They are very intelligent dogs and listens very well, but it is important that you train them correctly. When it comes to dogs your life will be much easier down the road if you start training them at an early age. With Cane Corsos there are no exceptions, to this rule of thumb. If you want a well trained adult Cane Corso, then go to work on properly socializing and training your puppy Cane Corso today. A well-trained Cane Corso will be very devoted to its owner and always want to please. It is also important that teach them to acknowledge and respect you the owner as the alpha. If not, they may start to be aggressive and try to assert dominance. When training a Cane Corso, it is important to always be very strong and firm, but never use physical force to punish them. If the dog is punished with force, they will not respect you as much and may also be more aggressive to strangers. Instead, the Cane Corso responds much better to lots of positive reinforcement. When he does good things give him a treat, and congratulate him with a pat and positive tone. 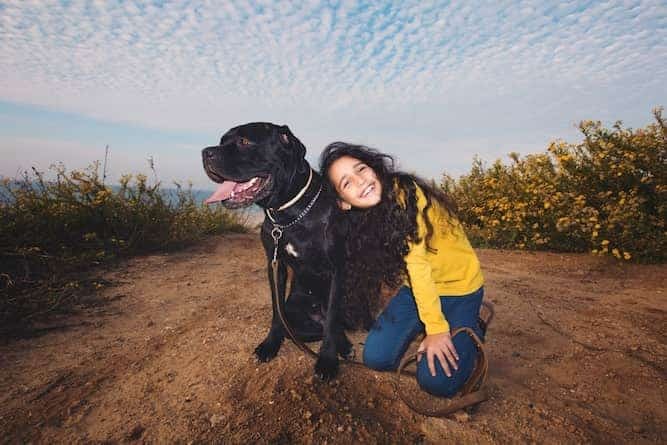 As long as you train them properly as a puppy, the Cane Corso temperament will remain devoted, loving, and gentle, and you will be sure to love them back just as much. 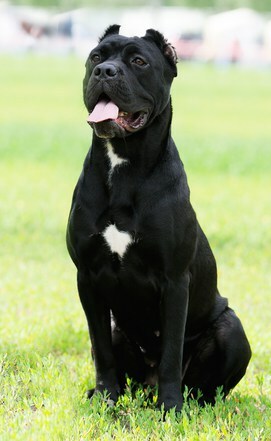 The Cane Corso is also one of those breeds that you cannot leave alone for long periods of time. He is never happier than he is with his family – and he is never unhappier than when they’re gone. If you have the kind of schedule that keeps you away for long periods, this may not be a good breed for you. For help with training, you Cane Corso take a look at The Online Dog Trainer by Doggy Dan. Doggy Dan is an expert Dog Trainer based in New Zealand. His online resource contains Hundreds of Excellent Dog Training Videos that will take you step-by-step through the process of developing a healthy, happy well-behaved dog. You may not think so, but for the Cane Corso shedding is actually a regular occurrence. His short coat is double-layered, and his undercoat sheds throughout the year. Spring is actually shedding season for the Cane Corso. Brush him weekly to promote new hair growth and to prevent the hair he sheds from going everywhere. There is the black Cane Corso and the blue Cane Corso. There are also fawn, black brindle, red, grey, and chestnut brindle Cane Corsos out there. For the Cane Corso ear cropping may be something to consider. It may seem cruel at first, but experts actually recommend you crop a Cane Corso’s ears when he is between the ages of 8 and 12 weeks old. The reason for doing this is because the weight of the dog’s ear can actually erode the cartilage in the ear. As a result, he may have more difficulty making his ears stand upright when he’s older. If his ears don’t stand upright, they may be more prone to infection and other complications. You may, therefore, be doing your dog a favor by having his ears cropped. Most Cane Corso dogs are healthy, but you still need to be aware of the problems that can affect this breed specifically. This is especially true if you buy the dog from a disreputable breeder, or if the shelter you adopt from is unsure of the dog’s history. As far as the average Cane Corso size is concerned, females are between 23 and 26 inches, while males are between 24 and 28 inches tall. A normal Cane Corso weight is between 88 and 99 lbs. for a female and 99 and 110 lbs. for a male. So, if you’re looking for a big dog, you’ll hit the jackpot with this one. The Cane Corso’s life expectancy is between 10 and 12 years. So, you think you’d like to add a Cane Corso puppy to your family? That’s great! You can find a Cane Corso for sale either from a breeder who specializes in Cane Corso puppies or at your local animal shelter. The average price of a Cane Corso puppy for sale is around $1,500. 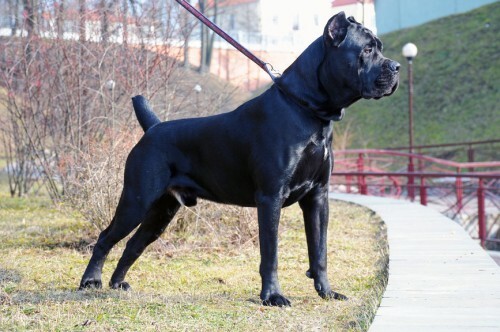 However, it is not unheard of for the Cane Corso price to be as high as $4,000! The price of the dog depends on the breeder, the health and temperament of the dog, and the purity of his pedigree. If you’re interested in a Cane Corso rescue, you may be able to find one through your local animal shelters. However, because a shelter’s “stock” changes all the time, you may not strike gold on your first search. You may have to call several shelters several times to find the dog you want. It also helps if you’re open to a Cane Corso Mastiff mix. Many times, shelters will have more mixed breeds available than pedigrees. Adoptions are better for those on a budget, or those who want to skip the puppy stage. While a shelter dog may have issues, especially if he’s been in the shelter for a while, at least he’s probably housetrained. If you’re looking for a reputable breeder, it’s always good to go through the AKC’s website. You can usually trust that the AKC wouldn’t put its name behind a breeder who isn’t above-board. Else, to make sure you’re dealing with someone reputable, make sure he or she is licensed. They should also be able to give you the certifications and information necessary to make a decision on the right dog for you. Conclusion: Why the Cane Corso? The Cane Corso temperament is a fickle one. It is absolutely crucial that you socialize and train him well while he is young so that he grows into the dog you want. The Cane Corso is a calm, quiet dog, and he feels a strong devotion to his family. He requires a decent amount of grooming, despite being a shorthaired dog, but it’s nothing you can’t manage. Perhaps one of this dog’s best traits is how trainable he is. He’s smart, he likes to learn, and he loves to please. This is the ideal cocktail of traits as far as training is concerned.